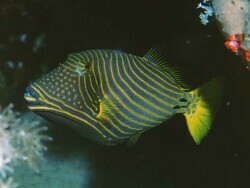 Triggerfishes belong to the beautiful Family „Balistidae“ and contains approximately forty species in eleven genera. 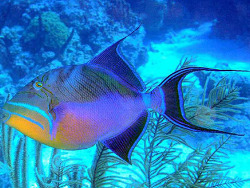 They are usualy found in tropical waters around the world, including the Mediterranean Sea and the Atlantic, Pacific, and Indian Oceans. 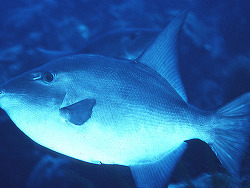 While many species only grow up to 30 cm in length, there are some triggerfish that are three times that size. 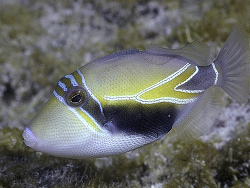 There is a wide variation of needs and personalities across the genera; even within a species there can be tremendous differences in individual fishes. 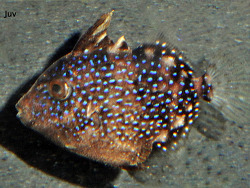 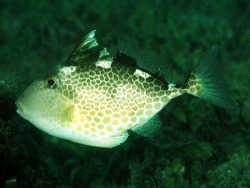 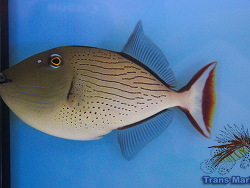 Triggerfishes are very divergent from the ordinary spiny-rayed fishes anatomically. 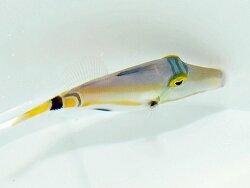 Their external appearance is so characteristic that they are not apt to be mistaken, unless for their close relatives, the filefishes. 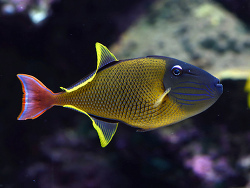 About half of those species are commonly seen in the hobby, and they are some of the most intelligent, hearty and attractive fish available to the marine aquarist. 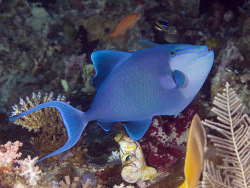 Their common name refers to the triggering mechanism in the first two of their three dorsal fin spines. 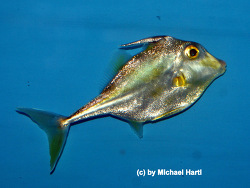 They have a top dorsal spike that can be put into an up or down position by the fish. 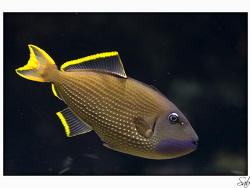 At the bottom of the body, where it widens out, there is another smaller, permanently extended type trigger that can be flexed too. 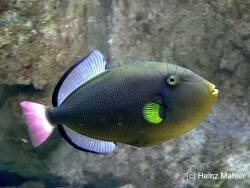 When this fish wants to hide it will go into a hole, stick up its top trigger and flex its bottom trigger, which locks them both into place. 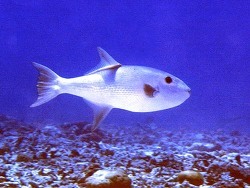 The force of the top trigger in conjunction with the smaller trigger on the bottom wedges the fish into the hole. 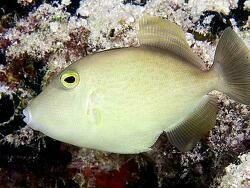 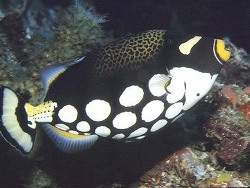 Once a Triggerfish has "trigged in", it is next to impossible to remove them from their hiding place. 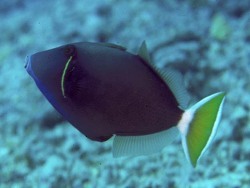 This is a trait triggers have for protection. 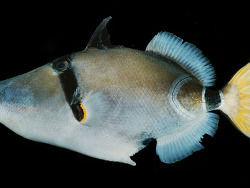 Member of the Family „Balistidae“ have eyes that are set far from their mouths, and serve as protection from the claws and spines of typical prey such as crustaceans. 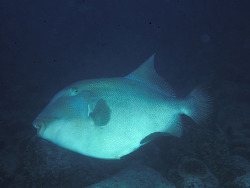 They have small mouths, with fused jawbones and strong teeth designed for breaking up coral and rocks and crushing hard shells. 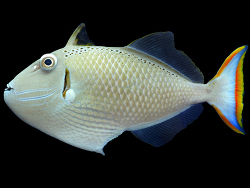 Some Triggerfishes feeding on soft-bodied invertebrates as jellyfishes. 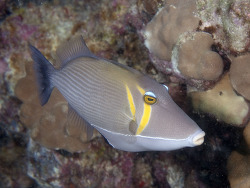 Other blow a jet of water out of their mouths onto sand bottoms to expose burrowing invertebrates; and some are specialize in eating spiny sea urchins or even clams and oysters. 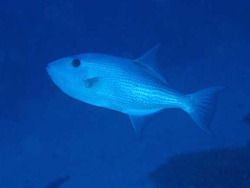 Some are more zooplankton feeders as for example members of the genus Xanthichthys and Melichthys and less prone to going after small fishes and coral. 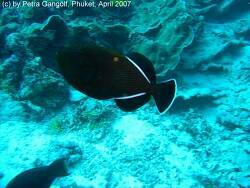 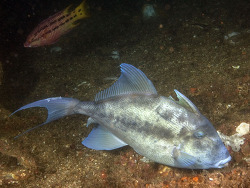 Of the so-called reef safe triggerfishes, species from the genera Xanthichthys and Melichthys are the clear choices with the former thought by many to be even more reef safe than the latter. 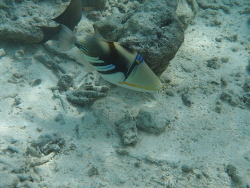 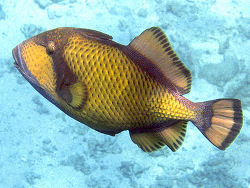 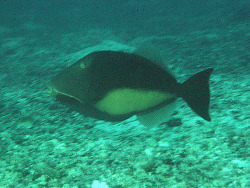 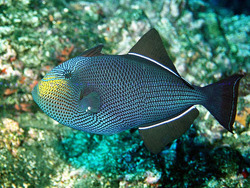 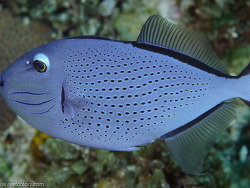 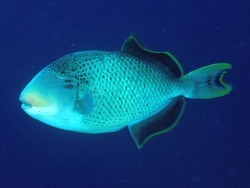 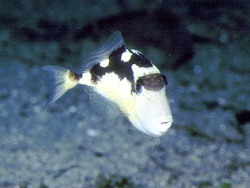 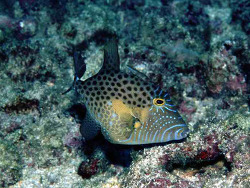 They have relatively peaceful dispositions and are considered to be the most mild-mannered triggerfish species available in the hobby, Keep in mind, however, that while most other Triggerfishes they make great peaceful community fish when young, they notoriously become supremely aggressive as they get older. 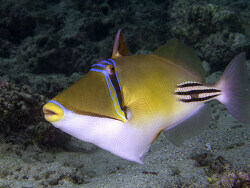 In conclusion, triggers are undoubtedly personable, hardy and attractive fish. 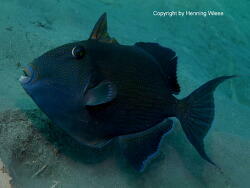 They can be the real darling of a large marine system or they can turn into a veritable terror.